Built in 1847, the Hill Brick Block at the corner of North and Main Streets is both much the same today and much changed. 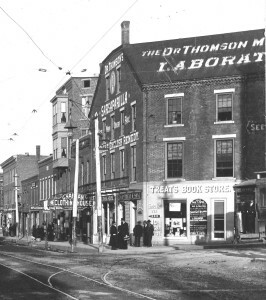 In the photo above taken about 1900 the building was filled with businesses on the ground floor, lovely apartments overhead and a third floor occupied by Dr. Thomson Medicine Company and Laboratory. Today the building is empty, for sale and in very poor condition. 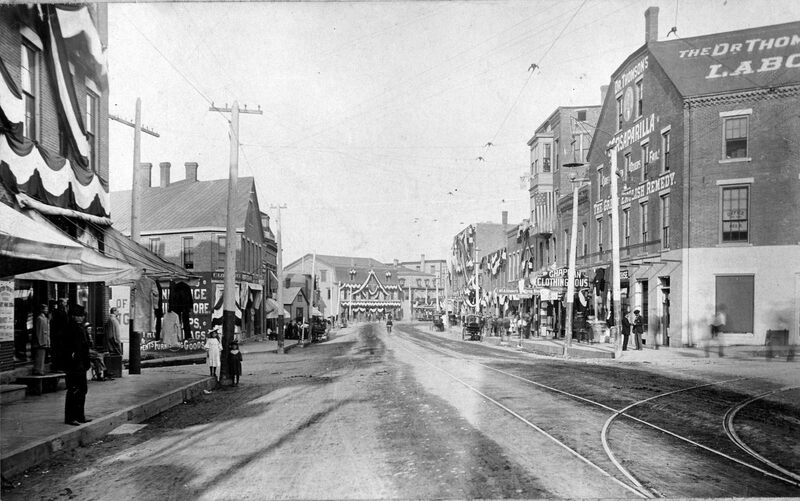 A hundred years ago, however, this section of town was bustling with every store front in use and every foot of Main Street occupied by a building, including the many brick blocks constructed after the great fire of 1870. 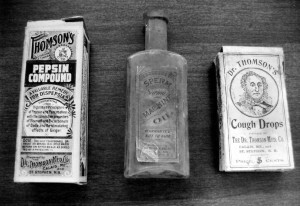 Dr Thomson’s Medicine Company produced a variety of patent medicines and other products beginning in the 1890’s. 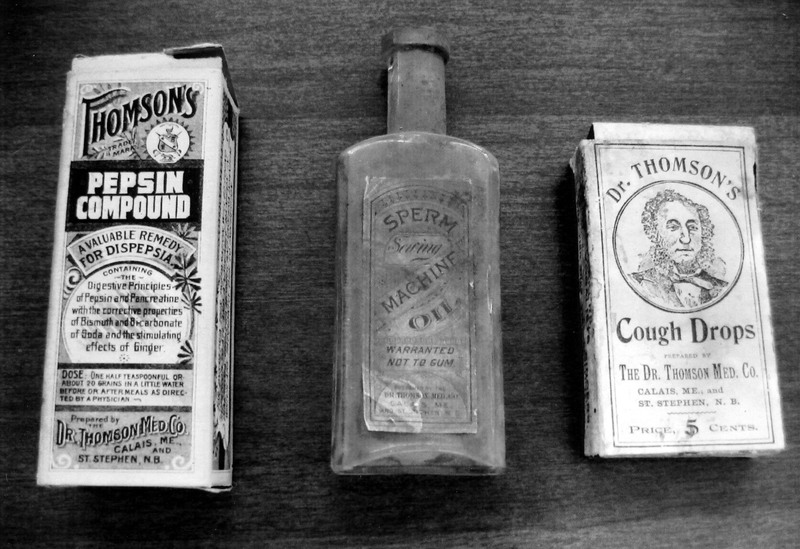 The above is a sample a Dr Thomson’s products but does not include a photo of his most famous and profitable product- Dr Thomson’s Sarsaparilla- the tonic that ” Cures where others fail”. 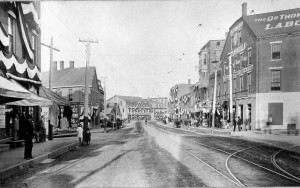 In fact the historical name for the brick building at the corner of North and Main is the “Sarsaparilla Building.” Tonics were the “go to” medicine of the day, curing whatever ailed you and containing in small quantities all manner of herbs and traditional medicines and in large quantities alcohol, opium and even cocaine. The result was a very sick and addicted population and the creation in the early 1900’s of the Food and Drug Administration which led to the decline of many patent medicines. Dr Thomson was not a fictional doctor but an actual person and perhaps even a doctor. He was born Robert C. Thomson, son of the locally well known Reverend Skeffington Thomson of St Stephen. He is said to have studied medicine under our own Dr Job Holmes and claims to have been a graduate of Bellevue College in New York after which he moved south for his health just before the Civil War. Legend has it he joined the army, although we don’t know which army, only to return to this area after the war to become the founder of the Dr. Thomson Medicine Company and developer of a line of patent medicines which were concocted, boxed and bottled on the third floor of the “Sarsaparilla Building”. Much of this history is questionable. Thanks to the miracle of Google Books the records of Bellevue Medical School in New York, one of the first medical schools in the country, are now available and there is no record of Robert’s attendance or graduation from the school. 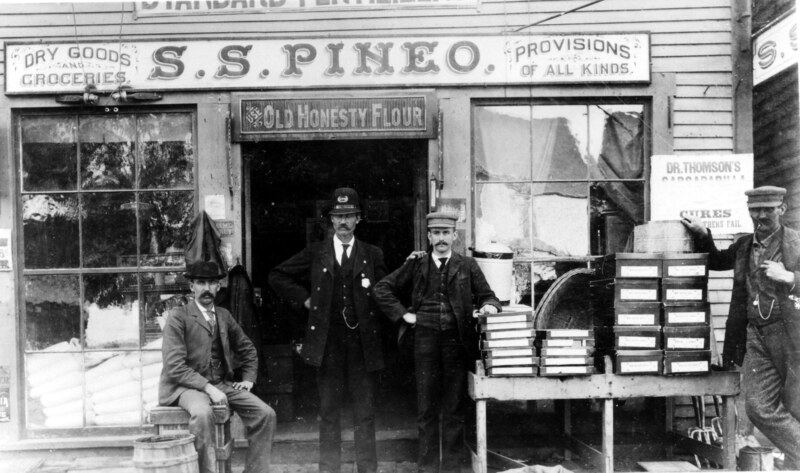 We could find no record of his service in either army during the civil war and, more tellingly, he died in 1883, a decade before the Thomson Medicine Company began selling sarsaparilla or anything else. In his favor, however, there is mention in an historical work on popular medicines of “Dr. 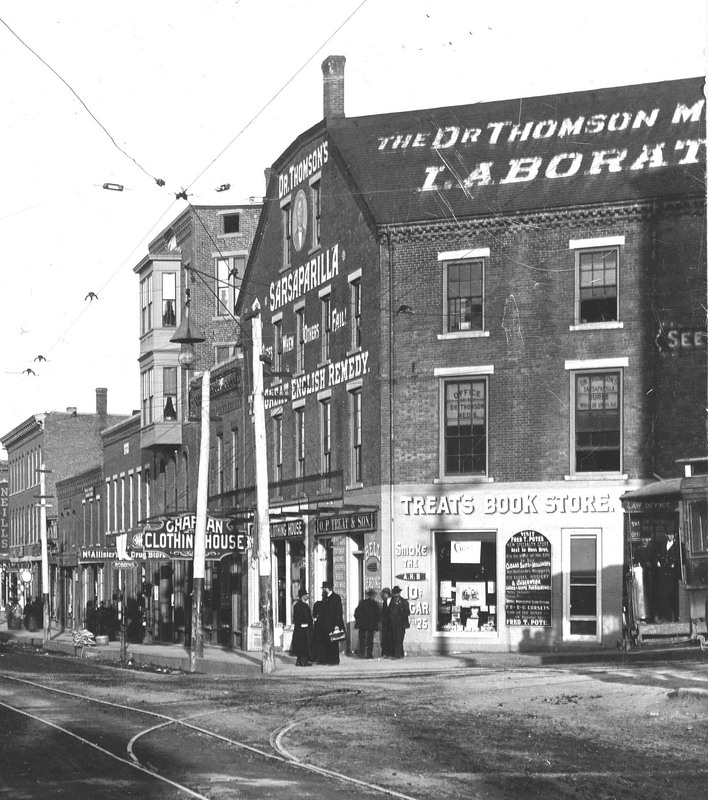 Thomson’s Sarsaparilla, Dr Robert Thomson developer” and his company. There was even a ” triumphal march”, whatever that may be, composed praising Dr Thomson’s Sarsaparilla by Walter W. Gillman of Calais of which we have a copy. 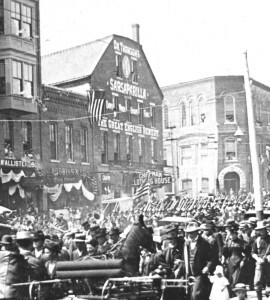 We are not sure where it was performed or when but we do know Gillman was a local boy who lived with his parents in the 1890’s on Main Street. In the Calais directory of 1897 he is listed as a medical student so apparently composing “triumphal marches” was only a sideline. The company is mentioned in the Calais Business directory of 1897 but the only name associated with the company is W.A. Murchie, a scion of the Murchie family which had extensive business interests on both sides of the border. This leads us to speculate that some local businessmen obtained the right to Dr Thomson’s formulae after his death, formed the company and perhaps even created the legend of Dr Thomson to impress the buying public with the efficaciousness of the products. Whatever the truth as late as 1915 Dr Thomson’s remedies were still on the market. 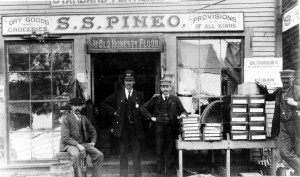 This photo of Pineo’s Store on Main Street in Milltown was taken in 1915 and an advertisement for Dr Thomson’s Sarsaparilla can be seen to the far right.